Founder of controversial WikiLeaks organization now owns Wikileaks.com domain name. Last week I wrote about how the domain name wikileaks.com had expired. The domain name was registered by Wikia, Inc, the group behind Wikipedia, for defensive reasons after the official WikiLeaks site Wikileaks.org launched. Wikia was trying to hand the domain name over to WikiLeaks and its founder Julian Assange, but Assange failed to accept the transfer and the domain name expired on January 3, 2011. 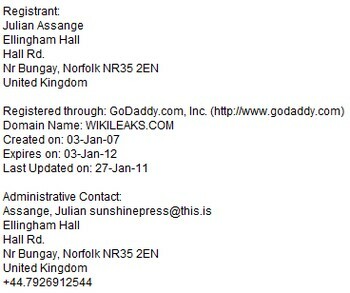 Just today the domain name was renewed and is now registered to Julian Assange, according to whois information. The DNS for the domain name has not been updated and it still points to a holding page. So the “according to whois records” is what this info is based off of and somebody other than Julian may own the domain. I know a lot of people (including myself) put a lot of faith into whois data, but it’s one of the easiest things to do what you want. It really should be called “who do you want to be”. @ Jamie – yes, but it was owned by Wikia, and they transferred the domain to someone in the Wikileaks organization. They weren’t going to renew it. So does Julian himself own it, or is it someone in his organization? Doesn’t really matter. Finally something that is of intrigue shows up on the DOMAINERS network first! Cool that you caught this and posted so soon Congrats Andrew. Im frankly shocked that wikia group (te wikipedia people) would want or have wanted to effortfully give the domain to wikileaks. It shows support for wikileaks, which I have my own opinion on but I am not here to condone wikileaks or not. What surprises me is that wikipedia has made it clear that they wish to support wikileaks and a lot of people might not like that, yet wikipidia is always asking this same general public for money/donations as that is apparently their business model. Could they really think that supporting wikileaks would either be beneficial or have no effect on their donation revenue? I’m just saying that somebody (other than Wikia, Julian or somebody affiliated to Julian’s organization) may have gained access to the domain as it expired (you stated that Julian did not accept the transfer before it expired). I just think it’s a little fishy and it’s easy to input whois data to make people who view it, think otherwise. @ Jamie – it expired but didn’t go through the deletion or auction process. I backorder the wikileaks.com i had it on auction with GD.When Wikia renew it i had 9 more days on auction before i would have it.i was alone in to the auction.The same day it was renew GD send me an e’mail if i want to make a bid,i thought that was weird because i was the only guy auctioning it.Then i look in to my acc.on watching list and it was not there anymore.What i think happen, Wikia didn’t want the .com.net.us.biz i would think they were tinted domains and sold them to Julian. i think this was a legit transfer. you can see the old whois info at DomainTools. Rich, same thing happened to be. GoDaddy now allows multiple backorders, if there is only one backorder the name does not get auctioned (but you wait the 5 days). If they send you the note you know someone else backordered it and it goes to auction. Minutes after I bid I got the note that the auction had been closed because the owner had renewed.